Get organized. 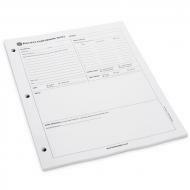 Keep valuable records on your kilnforming projects, using forms designed by Bullseye technicians. The three-hole-punch format fits standard binders, as well as the Bullseye Techbook.